In Music We Trust - INTERVIEW: Gwenmars: Brit-Pop? Power-Pop? Just Good Rock! Brit-Pop? Power-Pop? Just Good Rock! 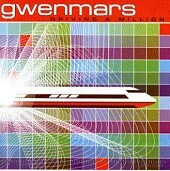 A collection of Brit-Pop and hard-driving American psychedelia, as well as some straight ahead power-pop goodness, Los Angeles' Gwenmars may be lumped in with Blur, Oasis, Dandy Warhols, and other similar bands, but a few listens to their latest release, Driving A Million, will prove them to be something quite different. IMWT: You've been called Brit-Pop, much like The Dandy Warhols, yet you're an American band. Do you feel the Brit-Pop tag is a just one? 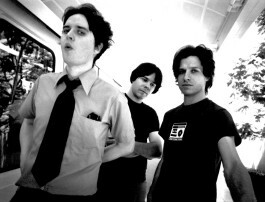 Mike Thrasher (Gwenmars front man): I don't consider Gwenmars Brit-Pop. We are more of a rock band. We just play music we like... whatever that is. IMWT: How do you defend yourself when people refer to you as a fake or a fraud because you come off as a British band, yet are based out of Los Angeles? Mike: I've always been influenced by British artists mainly... it's always been the coolest music to me. Why should we sound like something we don't like? With American rock so deeply entrenched in sound-a-like fake angst bands, anything different seems like it's from another world to people. We play what we like to hear. What we do musically is very real to me. IMWT: Do you feel you have anything in common with like-minded bands like The Dandy Warhols? Mike: Maybe... good taste? Ha. The Dandy Warhols are much more mellow than us, though. IMWT: What do you feel you add to the Brit-Pop sub-genre to make it your own? To distinguish yourself from others like your band? Mike: We definitely rock more... kind of noisier. Our songs are more classic, arrangement wise. More defined... structurally. Mostly though, I think the thing that separates us from others is the variety in types of songs we do. Most albums out now and the past few years have one sound or feel throughout. We cover a much broader range. IMWT: From a songwriting standpoint, Mike, you write all the songs. Do you write the basic structure and lyrics and have the band flush everything out, or do you come in with lyrics and scraps and build it from there? Mike: Yes to the former... 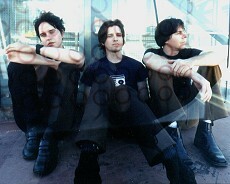 I write the basic song structure and Matt and John write their parts. We play around with it until the arrangement feels right. The lyrics sometime I've already written, sometimes they arrive as we go along. IMWT: Your new album is leaps and bounds more sonic than your EP. What do you contribute to this? Mike: Cool... Thanks. Sonically? I don't know...we had a really good mastering job done I guess. John Fryer and Richard Podolor both did very good work as producers as well. A little more care was taken. IMWT: Where do you feel this album will lead you in terms of future songs and albums? Mike: I'd like to experiment more instrumentally on the next one. We've never really had time in the studio to explore the possibilities. It's always been fairly rushed. Judging from the songs we already have for a follow up, I think our sound and songwriting style is going through an evolutionary phase right now. Very interesting stuff. I'm excited to see what's gonna happen. IMWT: How does the band pull off the heavy-guitar songs and slick production live? Do you go for a raw feeling or bring an extra guitar player on the road to help thicken things up? Mike: The guitar system I use sounds like two (or three) guitar players. It's funny. We tried using another guitarist for a little while... it just jumbled things up too much. Also... we don't use any backing tracks live, which are so popular with bands now. What you hear is actually being played (if that's what you mean by raw). Imagine that. Ha. IMWT: How do you feel about the live show compared to the recorded sound? Mike: Other than what I previously stated, we love being on the road and playing live. I'm not one of those people who wants to hear the exact record when I see a band in person. I want to get a real performance of that band at that moment in time. That's what we do. Also we've added some interesting visual things. Our show is a very special thing to us. IMWT: On your latest, is there anything you're unsatisfied with? Anything that bugs you and you wish you could go back and change? Mike: Well you know there are always things that you wished you could've spent more time with... some the vocals I think sound rushed and could've been better... some of the mixes. But I am the worst judge. I'm way too close to it to be objective. When I hear it, not knowing who it is... down the hall or something, it always perks my interest. IMWT: On the same note, anything that blows you away and you can't believe you wrote it? Mike: I can appreciate the songwriting... "Neon Tom", "She Hung The Moon", "Radio Gun", "Come Here", "The Race"... all pretty cool stuff. "Train Song". IMWT: How has the band been received lately, both by people who buy the album and by those who check out the live show? Mike: The crowds have been excellent. The reception at our shows have been amazing! People love that there's something else going on besides what's crammed down their throats everyday. Its pretty awesome. It feels very fresh. The reaction to the album has been very positive as well. We knew going in this... was no flavor of the month type thing, but people are relating to the songs like i hoped they would. IMWT: What's next for the band? Any plans to tour? Mike: We've been on the road for the past two months... looks like we'll be headed back out in the next couple weeks for a headlining West Coast type thing. See gwenmars.com for info. The album comes out in Europe September 5th, so we're very much looking forward to that. And, as always, writing more songs. IMWT: Anything I left out you'd like to cover?